A France-born, London-bred internationally acclaimed artist, Jean Jullien will be exhibiting his artwork for the first time at the GALLERY TARGET in Tokyo, Japan. Jean Jullien’s signature style comes from his observational take on modern day-to-day life. The characters created and drawn with his distinctive black line illustration style has established him to be one of the most sought-after image makers in the world. 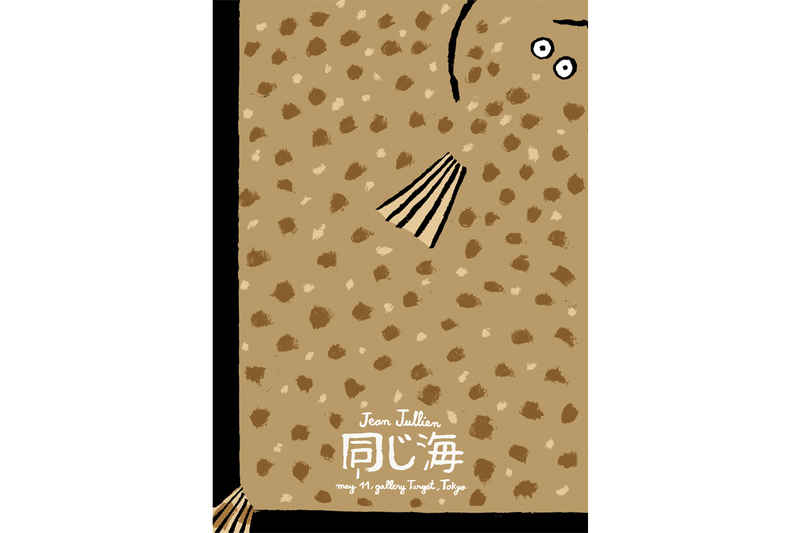 Jullien also has grown up with strong fascination with the Japanese culture since his early age. His appreciation towards the Japanese cultural co-existence of the classic and the contemporary has been an influence in his artistic career. The exhibition puts a spotlight on different aspects of his works, along his rich sense of humour. Growing up near the sea in Nantes France, Jullien takes inspirations from his experiences with the sea and develops his views towards the activities around it in this exhibition. Jullien explains, “from the beach of Malibu to Belize to Greece or Iceland, it seems like the sea is the same, like a travel companion which reminds you of home. It’s an incredibly powerful element, changing yet constant. I wanted the exhibition to be about that: the ocean, it’s fauna and flora and the activities around it.” Bringing his remembrance of travels and the breeze of Brittany to Japan, this exhibition will showcase series of paintings created through the eyes of his unique observations. There also will be a range of Jean Jullien’s original drawings, merchandise and T-shirts available at the gallery. Jean Jullien is a French graphic artist educated at London’s Central Saint Martin’s and Royal College of Art. His practice ranges from illustration to photography, video, costumes, installations, books, posters, and clothing to create a coherent yet eclectic body of work. He has shown work with Tate Museum, HVW8 (Los Angeles and Berlin), Wythe Hotel in Brooklyn, the National Museum of Singapore, Kemistry Gallery in London and MIMA Museum in Brussels, among others. He has illustrated for Colette, The New Yorker, National Geographic, MuseumsQuartier Vienna, Phaidon Press, UNICEF, Eurostar, Majestic Wines, The Wall Street Journal, Transport for London and many more. He currently lives and works in London.